The entire Freedom Caucus opposes the omnibus spending bill. The House will vote on the legislation within the next 36 hours, which the Freedom Caucus argues gives lawmakers inadequate time to read the bill. The policy proposals outlined in this $1.3 trillion spending bill are not consistent with what we told the American people we would do when they sent us to Washington. Many of the policies in the bill are in fact the opposite of what we promised. This bill barely provides for border security, yet continues to allow federal dollars to flow to sanctuary cities. It includes the ‘Fix NICS’ proposal, without including reciprocity for Americans with concealed carry licenses—something congressional leadership promised would not happen. It also fully funds grants that go to Planned Parenthood while making no changes to reduce Obamacare’s burdensome regulations on America’s families. And on top of the massive price tag, leadership is forcing a vote on this 2,232-page bill in under 36 hours, far from an adequate amount of time to read and analyze it. This is an insult to America’s taxpayers, as well as their many rank-and-file representatives who had no say in the omnibus negotiations. Rep. Ted Budd (R-NC), a member of the House Freedom Caucus, released a statement on Wednesday night lamenting that Senate Minority Leader Chuck Schumer (D-NY) got his Gateway Bridge tunnel, while President Donald Trump received no significant funding for his promised southern border wall. It’s a bleak day for North Carolina taxpayers. Ultimately, Schumer got his tunnel, but the president did not get his wall. The more than $500 million included for Gateway in this spending bill is the camel’s nose under the tent for funding the entire $30 billion project on the back of the federal taxpayer. The fact that this program would be funded over overwhelming Republican objections, including President Trump, the Senate, and the House, is a disgrace. Add in funding for sanctuary cities and Planned Parenthood without funding for the border wall, and this bill is truly catastrophic from a conservative perspective. I will vote no. Rep. Paul Gosar (R-AZ), another House Freedom Caucus member, argued in an exclusive interview on Tuesday with Breitbart News Tonight that “We’re kicking our base in the teeth” with the omnibus spending bill. 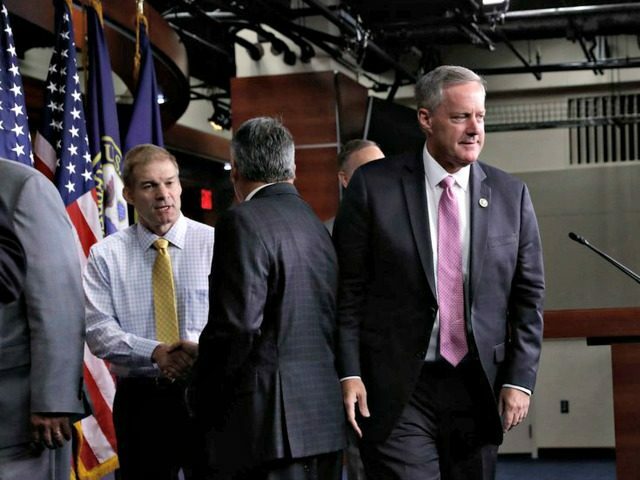 Meadows suggested that it will be “incumbent on a majority of the [GOP] majority” to change the spending process.